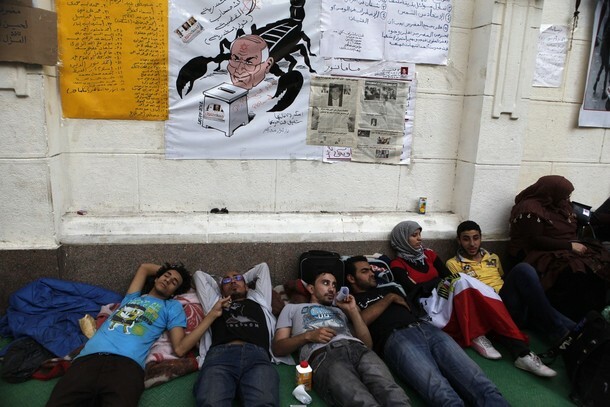 (Reuters) Protesters lie down during a hunger strike in front of Egypt’s cabinet office in Cairo June 11, 2012. Around 60 activists are on the sixth day of a hunger strike demanding that former military man Ahmed Shafik is banned from running for president, and for the release of thousands of prisoners held by the military. The protesters say they will continue the hunger strike until June 14, when a court will rule on the validity of a law passed by parliament but not implemented that Mubarak-era officials be banned from participating in politics. This entry was posted on June 14, 2012 by latuffcartoons. It was filed under Cartoons and was tagged with Ahmed Shafiq, cartoon, Egypt, Hosni Mubarak, Latuff, presidential election, Reuters.